"A tough call," nodded the hunter, "but I figured no one is going to steal Henry." 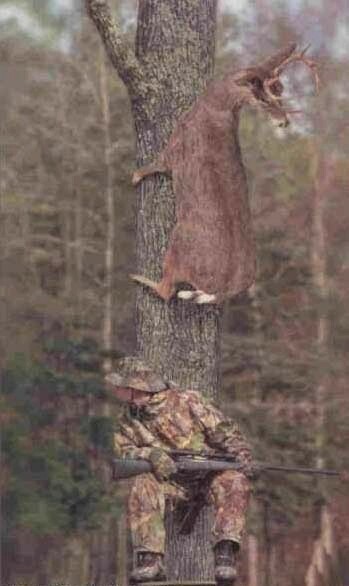 One day Dave and Fred were Deer Hunting, and they got lost. Dave tells Fred "wait, don't panic I learned what to do in case this happens. Your supposed to shoot up into the air three times and someone will here you and come with help,"
"Okay" said Fred. So he shoots three times into the air. They both wait an hour and no one shows up. So they shoot three times again and still no one shows up. Bewildered they try this again and again for the next couple of hours. Fred starts to look a little worried, then he shouts "It better work this time, were down to our last three arrows!" Two hunters got a pilot to fly them into the far north for deer hunting. They were quite successful in their venture and bagged six big bucks. The pilot came back, as arranged, to pick them up. They started loading their gear into the plane, including the six deer. But the pilot objected and he said, "The plane can only take four of your deer, you will have to leave two behind." They argued with him; the year before they had shot six and the pilot had allowed them to put all aboard. The plane was the same model and capacity. Reluctantly, the pilot finally permitted them to put all six aboard. But when the attempted to take off and leave the valley, the little plane could not make it and they crashed into the wilderness. Climbing out of the wreckage, one hunter said to the other, "Do you know where we are?" "I think so," replied the other hunter. I think this is about the same place where we crashed last year!" A couple of deer hunters are out in the woods deer hunting when one of them falls to the ground. He doesn't seem to be breathing, his eyes are rolled back in his head. The other guy whips out his cell phone and calls 911. He gasps to the operator, "My friend is dead! What can I do?" There is a silence, then a shot is heard. The guy's voice comes back on the line. He says, "OK, I'm sure he's dead, now what?"